For those notes that need to say pristine and in perfect nick, our Manuscript Hard Back Notebook steps in as the perfect solution. 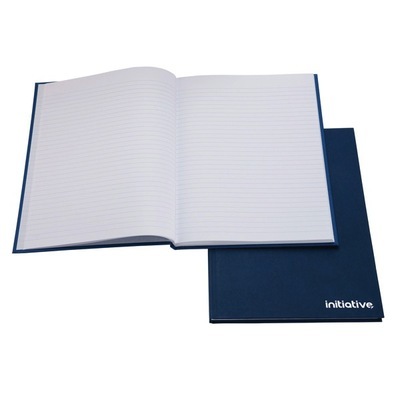 Designed for the modern worker with an appreciation for professional design, this sleek notebook boasts a hard and durable cover in a deep navy tone that pairs effortlessly with a wide range of stationery lines. The durable binding holds every sheet in place during use while also allowing it to be stacked for display on shelves and easily identified afterwards. Each piece of paper has a feint and ruled margin - perfect for laying out information clearly with a white finish that contrasts perfectly with both blue and black inks. Holding 96 individual pages - each double sides - this hard back notebook is ideal for jotting down everything from your latest ideas through to the key meeting notes. Our Stationery category has a wide range of products available for every need including our Shorthand Notebook and even our vibrantly colourful A4 Ring Binders - all at exceptional wholesale prices.